There are few things in life more delicate than wildflower blossoms and the soft splashes of watercolor on vellum. Native Pennsylvania, A Wildflower Walk, the newest exhibit at the Hunt Institute for Botanical Documentation, pairs the two wonders together to celebrate the historical intersection between the sciences and art in the world of botany. A collaborative exhibition between the Hunt Institute and the Carnegie Museum of Natural History’s botany department, Native Pennsylvania, A Wildflower Walk presents visitors with a painstakingly collected selection of plants and watercolors. The exhibition features the pairing of 36 watercolors by Richard Crist (CIT ’28) from the Hunt Institute’s collection with a significant selection of the Carnegie Museum of Natural History’s herbarium specimens. 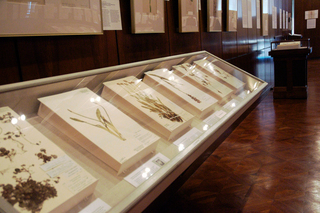 In addition to Crist’s watercolors and the botany department’s herbarium selections, the exhibit also features watercolors by painter Lyn Hayden and entomologist and painter Andrey Avinoff, which underscore the importance of herbaria in botanical research, education, and conservation. The concept behind the exhibit is to create a visual wildflower walk through Pennsylvania’s blooming seasons. A special emphasis is placed on endangered and rare species. Given Pittsburgh’s historically gray winters, visitors will surely welcome this early celebration of nature’s ephemeral splashes of color. At Carnegie Mellon, an environment in which most undergraduate students have a hard time taking a break, let alone going outside,Native Pennsylvania, A Wildflower Walk provides a convenient look at the delicate unfolding of Pennsylvania’s natural world. Located in the often-overlooked Hunt Institute, on the fifth floor of Hunt Library, the exhibit provides a quiet space for serene contemplation. The unfolding of the seasons lends the exhibit a gentle, logical progression that is sure to please those in need of a respite. In the exhibit, visitors can explore the intersection between the arts and natural sciences by viewing the juxtaposition of botanists’ tools and artists’ documentation on display. For those uninitiated in the traditional practices of botanical collection, the exhibit thoroughly describes common tools and their uses. The inclusion of Crist’s work alongside the herbarium selections provides a new perspective on the artist, given that historians remember Crist primarily as an abstract painter. Native Pennsylvania, A Wildflower Walk adds another dimension to the public’s understanding of his work as an artist. Along with his painting and printmaking, Crist was also an amateur botanist, author, and book illustrator. He wrote and illustrated several children’s books, including The Mystery of Broken Horse Chimneys, published in 1960 with his wife, Eda Szecskay Crist. He also provided hundreds of watercolor illustrations for the “Herbs” and “Vegetables and Fruits” volumes of The Time-Life Encyclopedia of Gardening in 1977. His work is in the collections of the Carnegie Library in Pittsburgh. For those interested in expanding their knowledge of the botanical world, The Hunt Institute for Documentation will be holding lectures through mid-June that will focus on Pennsylvania’s native plants.